#106) “Inconvenient Truth” Sequel: We needed Empire Strikes Back, but we got Clone Wars. MUCH RESPECT. The theater rises at the end of Al Gore’s Q&A. 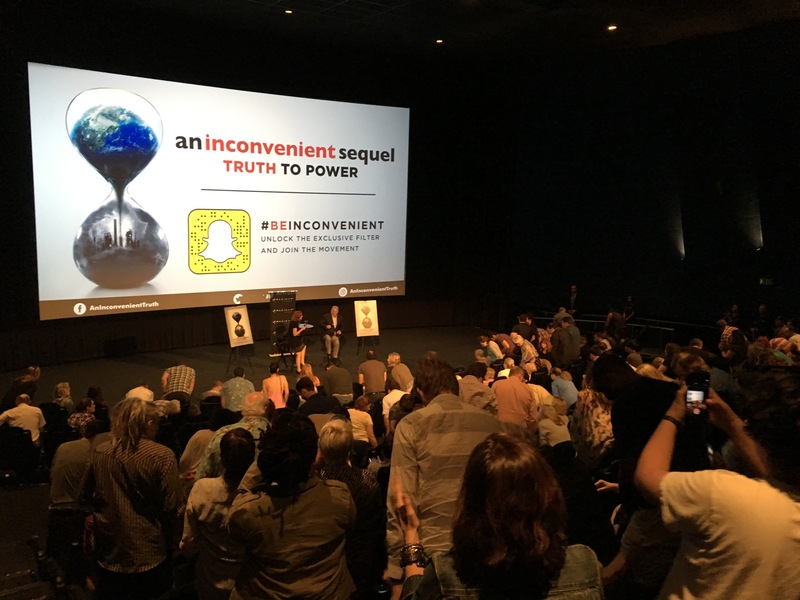 On Saturday I attended a screening of Al Gore’s new movie in Hollywood followed by a rather rigidly controlled Q&A in which the only Q’s came from the host. As expected, the movie was a little bit better than the first one in narrative structure, but not much. Once again the movie could have told a clean, SINGULAR powerful story, but … alas, it missed. Where does he get these filmmakers — didn’t they ever take any writing classes? There was a great potential SINGULAR over-arching narrative sitting there waiting to be told which was Gore’s efforts to bring around the India delegation at the Paris Accord on their climate negotiations. The story of them going from “no way” to “yes way” covered about twenty minutes late in the film, but it should have been stretched for the entire movie as the central narrative thread. It was powerful enough. Instead the movie is largely an “and, and, and” exercise, ambling from exploding glaciers to flooding Miami streets to our democracy being hacked by big money (complains the guy from the party that out-spent their opponents for the past three Presidential elections) — the usual shopping list of climate topics. I guess they feel like they’re conveying the global aspect of the issue by visiting so many places, but the problem is, if that’s the point you want to convey, then convey it in a single sequence about how global the problem is, not through an ambling narrative structure. Furthermore, stick to the narrative. Just before the Paris climate meeting the huge terrorist attack took place. It was powerful material, but it was also “off the narrative” of the movie. Yes, Gore gives a very heartfelt speech to the journalists about it, but it’s still OFF THE NARRATIVE. Powerful for powerful’s sake is not the way to tell a clear, focused story. There’s just too many amblings and diversions throughout. Didn’t these filmmakers read the editorial in the NY Times on January 19 pointing out that the Democrats have been sidetracked by trying to accommodate the various needs of a diverse America and thus have failed to promote a unifying narrative.” The movie does the same thing — pursues some sort of “more is more” agenda and ends up with failing to bring home a clear singular experience. Political strategist Dave Gold — one of my newest heroes — has a very simple way to convey narrative structure. He published a great article in Politico in February telling the Democrats to lighten up on the metrics, focus more on story. He says your central narrative is the Christmas tree, the issues are the ornaments. Gore’s Christmas tree should have been the India challenge. The movie should have opened in Paris — the Ordinary World — all the nations coming together to solve the climate problem. Then it should have made clear WHAT’S AT STAKE — why Paris mattered, what will happen if there’s not an agreement — who the major players are. It should have made us feel like everything is on track, just fine, BUT THEN … the India delegation says basically you people had your 150 years of burning fossil fuels, now it’s our turn. That moment should have happened about 15 minutes in. We should have then gone to India to see the consequences of global warming, heard from some of the people behind that attitude, learned about why their delegate would have said that and what it might take to change it. So much that could have been so logical and made for a great journey. Instead the movie doesn’t even go to Paris until about halfway through. The India storyline emerges around an hour in. What are they thinking — that telling a story is as simple as, “And then, and then, and then …”? Don’t get me wrong, there’s a few nice little moments such as the reversal of the India delegation at the Paris meeting, but it all weaves so ineptly back and forth, all over the place. And then ends with narrative poop as we see Gore walk into Trump Tower, obviously for the pathetic meeting he and Leonardo DiCaprio gave the newly elected Trump back in December where Trump clearly was just arrogantly toying with them. It cuts from Gore entering the building to a close up solo shot of him speaking to someone which obviously must be Trump. This is called THE OBLIGATORY SHOT in filmmaking parlance. If you show us the guy walking into Trump Tower, then Gore blabbering for about a minute, we will connect the dots and know he must be talking to Trump as we get ready for the money shot which is the reverse on Trump. At that point, the Trump shot is obligatory. Gore and his filmmakers really should do our Story Circles Narrative Training. Their circle would have figured all these structural elements out. It’s what the story circle does. Last year I ripped poor old Marc Morano’s climate skeptic “documentary” on Andy Revkin’s NY Times blog (btw, Doug Parsons just posted his interview with Morano for his America Adapts climate podcast where I join him for the analysis). I criticized his film for the same basic problems — a lack of compelling narrative structure. In his case there were also production shortcomings that were an inevitable result of his limited budget. For this movie they clearly have all the money in the world for their visual elements, but as my buddy Paul would point out, “Clone Wars” also had the stunning visual effects. It just didn’t have a good story. Why couldn’t they make “The Empire Strikes Back” for global warming?